The location of the setting where you enable the single-click of icons to open them always escapes me. I can never find it when I want to change it on my Mom’s computer. Single-click irritates me, but here’s how to enable or disable it in Microsoft Windows 10, 8, 7, Vista and XP. 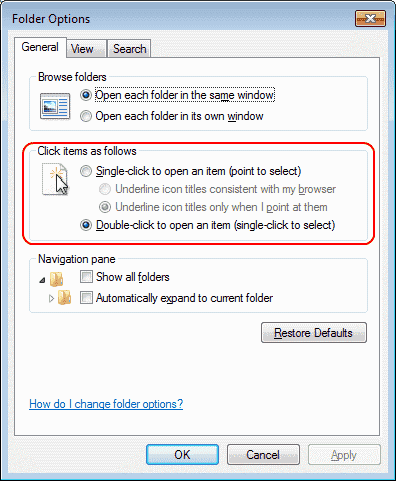 Right-click the “Start” button and select “File Explorer“. Select “View” > “Options” > “Change folder and search options“. In the “Click items as follows” section, choose between “Single click to open an item” or “Double-click to open an item“. Right-click the “Start” button and select “Control Panel“. Choose “Specify single- or double-click to open“. Click “Start“ > “Control Panel“. Check the option for Single click to open an item to enable single-click to open items. Check Double-click to open item to disable the single-click feature. Hi THANKS! it has been driving me crazy that single clinking.for the last few years. I am glad it was this easy to fix. Thanks again.